Great Story No Pictures! Arrrggghhhh! Hold on a minute….Now… I need to back up a day….Yesterday afternoon, about the same time, I was sitting in the house. Just out of the corner of my eye, I happened to see a quail bobbing her head up and down on the porch. We don’t get quail on the porch, unless it’s a Whoootooo….If you’re not familiar with the Whootoos, see blog post: A Quail Tale: We rescued and raised a couple of quail last summer and released them into the wild. They continued to come up and visit us on the porch for a few months before they were totally immersed in their new ‘wild’ life. So…when I saw the quail on the porch, I immediately thought Whoootoooo!!! I went to the sliding glass door, and low and behold, there SHE was- With her brand new family! Hubby and 6 tiny baby fluff balls! Our grandquailage! So the rest of the afternoon, and all day today, we were watching for them. So, I was on the porch this afternoon, waiting to see it the monsoon clouds were going to unleash something, and I spotted them! Whootoo and her little family scurrying across the backyard. But, they abruptly turned back, scurrying the other way then back and forth, back and forth. Stange…I was curious, so I tiptoed out to investigate. What I found, in the wash, was one of the babies on it’s back, flailing about, unable to recover it’s upright position. It looked like, perhaps, a thrasher, or dirt monkey had tried to nab it and swept it off his feet. As I watched a moment longer, the family ran off, leaving the little fellow flailing about! (like mother, like daughter, I guess!) Of course, instinct took over and I snatched the little fuzz ball up and ran back to the porch, grandquail in hand! Donna, my mother-in-law, was readily available to grab a towel, eye dropper full of water and a Miller Lite beer box. I placed the baby in the box (still in hand), under the towel, and got him to take some water. After my heart rate calmed down a little, I sat with the baby in hand, to get his heart rate down. We bonded a little, but I was pretty sure that he wouldn’t survive by himself. Unlike his mother, when we rescued her, she had 4 siblings with her. Plus, she was plucked out of the wild, the day she was born. This little guy, was all alone, and had enjoyed/endured his wild life for at least one or two days. We got the little quail settled in a little cage, with food, water and heating pad… But he was frantic! I felt terrible…I thought we bonded!! As I sat there worrying about his fate, I happened to see his family making their way towards the water dish in the backyard. I quickly plucked the little guy out of the cage and slowly made my way towards the family….”whoootoooo! whooootoooo!” I called out to his mother (that was our call). The family waited under the protection of a clump of cactus. I set their baby down and shooed him in the right direction. It was an amazing reunion! …Where was the camera!! 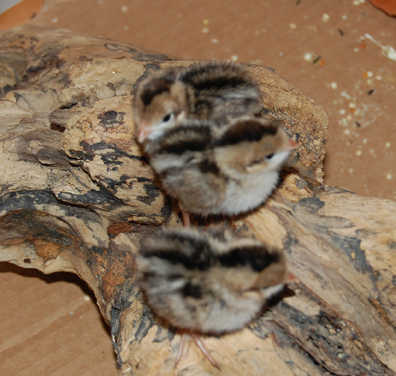 But here is last year’s photo….Mother Quail -the ‘Whootoos’ we rescued almost exactly 1 year ago on July 4th! I do believe our little grandquail looks just like his mom!